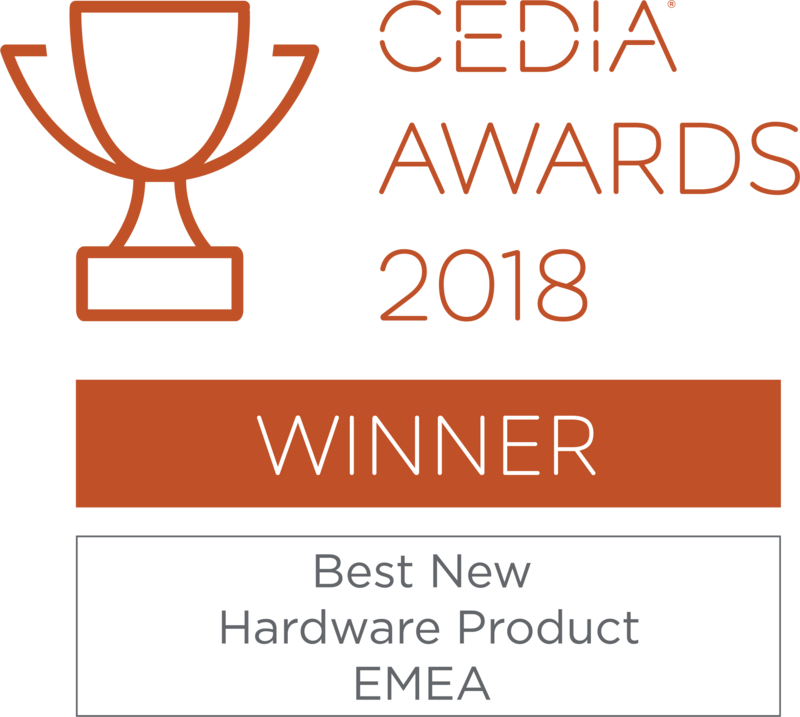 The 2N IP Verso was recently awarded the ‘Best New Hardware Product EMEA’ by CEDIA. Renowned in the home automation sector, the CEDIA awards program recognises technical excellence, product innovation and individual professionals succeding in the home technology sector. With a wide variety of modules available, the IP Verso offers a flexible solution that can be adapted to suit any commercial or residential application. Thanks to the Verso, users no longer have to work with standard one-size-fits-all products and can now custom their IP intercom/access control units through its modular design – it’s a solution we believe is throughly deserving of this prestigious award, congratulations to the 2N team! Yealink was recently awarded the 2018 Global Growth Excellence Leadership award by growth consultancy firm, Frost & Sullivan. Recognised for their position in the market, the award acknowledges Yealink’s sustainable strategy to achieve exponential growth from its compelling product range, competitive pricing and an excellent level of customer service. We would like to wish Yealink a huge congratulations on achieving this award! It was announced last week that Snom desk phones have been re-certified by Broadsoft. The new announcement confirms support of all desk phones from the D1XX, D3XX and D7XX series, including the brand new Snom D735. Our Technology Director, Tim Bray presented at UKNOF40 last week. Taking place at Manchester’s Central Convention Complex on Friday 27th April, the event was a free full-day conference for anyone within or interested in the internet industry. As the person responsible for our system developments, Tim knows a lot about internet security and regularly consults our vendor partners on their provisioning services. Find out what he had to say in his presentation, ‘IPv6 in an Office’ in the video below. We have been informed by Panasonic that phones manufactured in mid-2017 have a problem with the embedded client certificate. Affected devices are all TGP600/HDV series manufactured from July to November 2017. The issue is that the certificate loaded into the device at the point of manufacture only lasts for one year instead of the usual thirty. This affects provisioning systems which secure connections by validating a device’s client certificate. As a result of this, at some point in July 2018, these devices will start to fail to provision if client verification is being used. For customers using our provisioning platform, please contact us to organise upgrades of your phones. We can handle this automatically for you, but will require your consent to do so – phones will not be automatically upgraded. For customers using other provisioning systems, please get in touch with whoever manages the system to organise the upgrades. If they require assistance, we are happy to help. Panasonic has also provided a website for checking your phones. We would like to apologise on behalf of Panasonic for any inconvenience this may cause. If you have any questions, please don’t hesitate to get in touch, you can call us on 01484 840048 or email support@provu.co.uk. Before Christmas our very own MD, Darren Garland joined the Comms Business Live panel to talk all things digital. Focusing on Distributors’ vision of a digital future, the episode of #DisruptiveLive looked at how the partner channel will need to evolve to remain relevant – take a look at the recording below to see what Darren had to say. We recently sponsored the annual Comms Vision Conference in Gleneagles. Established in 2006, Comms Vision is one of the leading destinations for the UK’s major Channel Partners. It prides itself on providing a challenging and thought-provoking environment, helping industry professionals define future strategies, new technologies and opportunities. 2017 marked ProVu’s sponsor debut and it most certainly did not disappoint! Our Managing Director, Darren and Sales Director, Craig thoroughly enjoyed the conference with lots of interesting seminars, meetings and even some Golf and Clay Pigeon Shooting along the way. We look forward to returning again next year and would like to say thank you to the Comms Dealer team for putting on such a fantastic event! Here’s a short video of Darren talking about ProVu to Professional TV journalist, Bridgid Nzekwu at the event. ITSPA recently published a revised version of their recommendations for provisioning security – having been offering our own provisioning service for over 13 years, this is something we know a lot about. In-fact we often work with many of the world’s leading manufacturers and industry regulators to ensure their hardware provisioning capabilities are meeting industry standards and provide a secure provisioning method. But what makes our provisioning different from the rest – here’s 6 facts about ProSys Provisioning. 1. Our provisioning platform is not limited to select vendors or devices, we can provision an array of hardware from a variety of manufacturers – see our full list of provisionable devices here. 2. Our provisioning platform is developed in-house by our development team, they’re experts in the field of secure automatic provisioning. 3. Where possible, we use the recommended protocol, ‘HTTPS with factory installed client certificates’ as outlined in ITSPA’s latest guidelines and we have been doing so for years! 4. We make provisioning simple – our pricing structure is based on your requirements per device, meaning you only pay for what you need. 5. Providing it’s compatible, our provisioning server will accept adoptions, so if you have hardware deployed and registered to another server, we can help you to move it over to ours. 6. Post deployment, you can utilise our Management tool to take care of your provisioned items from the comfort of your own desk – read more about ProSys Management here. Zero-touch provisioning offers many benefits to ITSP and reseller partners. With just a few details, we can ship hardware direct to your end-user customer ready to work out-of-the-box for next day delivery – saving you both time and money. More details on our provisioning services can be seen here. To see ITSPA’s revised guidelines, download ‘Recommendations for Device Provisioning Security (Version 2)’.